Wood Expressions, Inc. has been manufacturing, importing and distributing games from around the world for over 30 years. 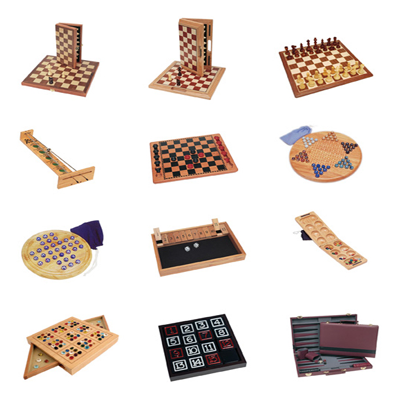 Chess is our specialty and we carry a wide selection of styles that are manufactured in a variety of materials. From the very traditional hand carved and hand polished Staunton Chess pieces to The Elvis Presley Chess set. We also carry many other beautiful classic games such as Backgammon, Cribbage, Dominoes, Combination Sets, Travel Sets, Casino Accessories, Mahjong, Go, Senet, Captains Mistress, Antiquity Games, Sudoku and many more. We are constantly searching the world for the best in chess and other board games. The wide range of price points for our games helps us cater to many different types of stores and needs. Our customers include catalogs, websites, game, toy, hobby, billiard, tobacco, luggage, book, department, jewelry, museum, library, golf, and gift stores. Every year we exhibit at several trade shows to introduce our new products and offer our vast selection to our customers. We can create an exclusive product that is tailored to your specifications for many of the products we offer. We differentiate ourselves from the competition with our licensed and exclusive products while being committed to excellent customer service.